While the Alliance Team tournament for 2018 has been put in the record books and the clock slowly pushes on. In today’s world of participation trophies, one team fought to reach an honorable mention in the record books. While all of the Alliance tournament (AT) teams fought hard for those top prizes, one team went above and beyond and the statistics show it. Their story so unbelievable that it desires a moment of investigation. Let’s take a moment and diving into the Cinderella Team of the Alliance tournament. Captain of the Team, Anveri Vestigo started in 2011 playing in highsec for a while before eventually graduating then to low sec. When he heard about the fighting in Null sec he wanted to head out there for the action. He went to a medium sized alliance called Phoebe Freeport Republic that was very heavy with AT team. Anveri saw this this and wanted to be a part of it. So he started taking notes and training from an early age in it. He joined up in the 2nd AT ever. When Histaria Concord was reformed Anveri went there and originally was a logi guy. Anveri claims that his mentor in that team was Ninja Uitoh. During his time in Histaria Concord their AT team won two and lost two during AT 15. Anveri actually tried to recreate his mentor’s style of an AT team for Triumvirate and believes he succeeded in his goal. The last Triumvirate team was two years ago, for the most part they had ran themselves into the ground and the team had crumbled apart. So Triumvirate had to rebuild their team. This years Triumvirate team was a fresh start with new leadership. They found the new leadership with Anveri Vestigo. While he had played Eve online for many years he was still a young 18 year old player. While he was only 18, he already had years of FC-ing and pvp play under his belt, he was the equal of any other veteran player. Anveri was joined with ElDiablo DelRojo, from the former Alliance Team, to become Co-Captain of the Triumvirate team. ElDiablo DelRojo depth of experience and leadership background was another pillar of experience for the team and for Anveri to draw from. Triumvirate team now with old school knowledge and new blood leadership formed the core for a chance to craft the next meta. The team’s roster was full of newer, fresher faces, unlike some of the other teams in the Alliance Tournament. This first year team and first year captain started training May. What they lacked in experience they made up with pure determination and dedication. They practiced 3 to 4 times a week. The Triumvirate team put in over 780 hours in practice alone. These massive chunk of time doesn’t include time spent theory crafting and building ships. Which was a huge time sink, remarked Anveri. Anveri was also thankful for the volunteers that helped with partners for their training. The members of the team had to sacrifice with the Corp and Alliance. Every day Anveri would take 10 to 15 guys away from the fleets to practice. Anveri said, “I hope to believe they are finally ok with so much time taken away from the fleets for the results we were able to achieve.” They would try to schedule practices around the clock. Members would get up an extra two hours before going to work just to make the training sessions. Anveri stated, the Triumvirate team went to the AT with the sole purpose of Fighting TEST. “We were at war with them and this was a grudge match.” This was a really big win for the guys on the team. They had reserved, quiet players screaming in the comms out from the excitement. It was an amazing thing to beat TESY 100 to 0. It made the practice and dedication worth it. After the battle with TEST the Triumvirate team were going to face off against Skill Yourself. The team began to have doubts, “man we might not make it. These guys are good.” However, those were private thoughts as the team went out to the field like, “Let’s do our best.” Then in similar fashion to their training, they defeated Skill Yourself team. 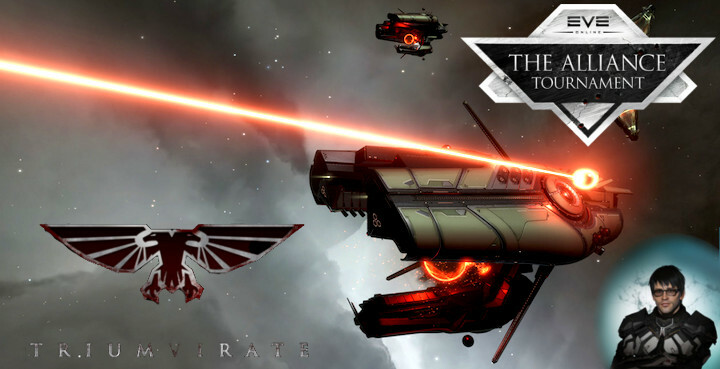 Templis Calsf was training partners with the Triumvirate team. They had worked hard together fighting. So when it came to the bans the team leadership knew what they were strong in. Anveri admitted, “it took away the good fight from them and I felt bad. However, All is fair in love and AT.” Anveri remarked, he really does like those guys and they were great partners. Triumvirate stacked a bunch of ECMs against the Templis Calsf and so they were able to permanently jam most of the team.The first kill didn’t come until about 6 mins into the match, which is a testament of how good of pilots of Templis Calsf were. Bright side of Death match was the scariest for Triumvirate as Anveri looked at the ships they brought this year and last and the bans they generally used. Anveri stated, “These guys never brought in the same comp twice, ever. So we were worried.” Sometimes Bright Side of Death would bring drones, which Anveri knew they were comfortable with. So Anveri was thankful when the team banned the Ishtar. If they brought drones and burst jammers though Mallas and Kares. “It would gimp or at least slow our DPS,” said Anveri. “The burst jams hurt us a lot. It was really stressful to keep people alive.” That match was really important to theTriumvirate team because they clinched the top 4 spot and the AT prize, AT ships. This had been the personally goa,l but was thought of as far fetched. I asked Anveri if there was any regrets in the AT tournament. He remarked that the only regret he had was not being able to tackle and pin down and kill the Northern Coalition Flag Ship. However Anveri remarked that there was some amazing moments. Such as the time in the 2nd match of the tournament he was down to 64% hull and he burned out his Afterburners to 94% and just when he thought we was going to be killed Irenia Tsurpalen his logibro for life was able to get reps to his beleaguered ally and save him. Asking if there was anything else Anveri wanted to add, here are his thoughts. Everything in EVE was devoted to the AT team for Anveri. Such was his dedication that the moment he went back to regular fleets after the AT and assumed the role of the “logi guy.” He would scream out info over comms before realizing he isn’t in the AT anymore. He found that he was calling out and over communicating like when he was on the AT team. Special thanks to Anveri Vestigo for taking time out of his schedule to help with this article. 1st and 2nd place for the Alliance Tournament came as no great shock, they were seeded first and second respectively. I believe the true show of grit and talent came from the Cinderella Team that came from nowhere, brought together by young fresh faces and did almost the impossible. A ranked 50th team placing 3rd place in a highly competitive match. This story I believe extends further than just EVE Online, this is also a life’s lesson. If you want something bad enough, you can achieve well beyond your dreams through hard work and determination. I don’t believe we have heard the last of the Anveri and his team. Hello there. I found your web site by means of Google whilst searching for a comparable subject, your web site came up. It seems good. I’ve bookmarked it in my google bookmarks to come back then. Hey there. I found your web site via Google even as searching for a related matter, your site got here up. It seems to be good. I’ve bookmarked it in my google bookmarks to come back then. Hi there. I found your website via Google even as looking for a similar subject, your website got here up. It appears to be great. I have bookmarked it in my google bookmarks to visit then. Hello there. I discovered your blog by way of Google at the same time as searching for a comparable matter, your website came up. It looks great. I have bookmarked it in my google bookmarks to visit then. Hiya, I am really glad I have found this information. Today bloggers publish only about gossip and internet stuff and this is actually annoying. A good blog with interesting content, that’s what I need. Thank you for making this site, and I will be visiting again. Do you do newsletters by email? Hiya, I’m really glad I’ve found this information. Today bloggers publish just about gossips and web and this is really irritating. A good blog with exciting content, this is what I need. Thank you for keeping this web-site, I’ll be visiting it. Do you do newsletters? Can not find it. Hello there. I found your website by the use of Google while searching for a related matter, your site came up. It appears to be good. I’ve bookmarked it in my google bookmarks to visit then. Hiya, I am really glad I’ve found this info. Today bloggers publish only about gossip and net stuff and this is actually annoying. A good web site with exciting content, this is what I need. Thanks for making this web-site, and I will be visiting again. Do you do newsletters by email? Hi there. I found your website by means of Google even as searching for a comparable matter, your website got here up. It looks good. I’ve bookmarked it in my google bookmarks to visit then. Hiya, I am really glad I have found this info. Today bloggers publish just about gossip and internet stuff and this is actually frustrating. A good blog with interesting content, that’s what I need. Thank you for making this website, and I’ll be visiting again. Do you do newsletters by email? Hiya, I am really glad I’ve found this information. Today bloggers publish only about gossip and internet stuff and this is actually annoying. A good blog with interesting content, that is what I need. Thank you for making this site, and I’ll be visiting again. Do you do newsletters by email? Hey there. I found your site via Google at the same time as searching for a similar matter, your website came up. It seems to be good. I’ve bookmarked it in my google bookmarks to visit then. Hi there. I discovered your blog by the use of Google even as searching for a related topic, your website got here up. It seems to be good. I’ve bookmarked it in my google bookmarks to visit then. I will begin a blog site. Together with numerous various other hopeful’s, I want to ultimately earn money off it. I noticed a lot of websites do not allow you to earn money of google ad feeling and also things like that. What are some websites I can start my blog site on that will enable this considering that it appears to be one of the most profitable means to generate income off a blog site?. Hiya, I am really glad I have found this information. Nowadays bloggers publish only about gossip and internet stuff and this is really annoying. A good site with exciting content, this is what I need. Thanks for making this website, and I will be visiting again. Do you do newsletters by email? Hello there. I discovered your website by way of Google even as looking for a similar subject, your web site came up. It seems good. I have bookmarked it in my google bookmarks to visit then. Hiya, I am really glad I have found this information. Nowadays bloggers publish just about gossip and internet stuff and this is really irritating. A good website with exciting content, that’s what I need. Thank you for making this web site, and I will be visiting again. Do you do newsletters by email? Hey there. I discovered your site by the use of Google whilst looking for a similar subject, your site got here up. It appears to be good. I’ve bookmarked it in my google bookmarks to come back then.